Wow, it's been a LONG time since I've done the SCS Inspiration challenge. It's a challenge I absolutely love because inspiration is so open to interpretation. Also, Stephanie picks the BEST shops and stuff to be inspired by! This week's challenge was to be inspired by pillows from Bonjour Mon Coussin. They have a wide variety of all sorts of pillows. It's a very fun shop! Here is the pillow that inspired me. I really liked how simple it was compared to the rest of their designs. Not that I'm against loud, this one just spoke to me. For my card, I just used some grey card stock and stamped on two different sized flowers from the Unity August KOTM in two different colored inks. Then I added some sheer ribbon. A one layer card, who would have thought it? Wow, this is beautiful! I am really enjoying the simple cards... sometimes they have more impact then the elaborate ones! Beautiful... love that pillow too! Love your take on this challenge. This is just beautiful. 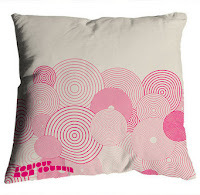 this pillow screams one layer card to me! love how yours turned out too! 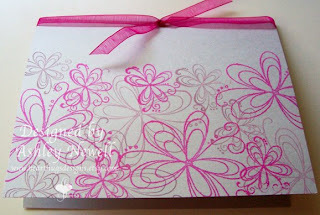 That is such a pretty, pretty card and sooo perfectly pink!!! This is pretty and a great interpretation of the inspiration piece. Perfect take on the challenge! I'm not surprised Lee likes it, too. It's PINK!!! Therefore it is awesome. Love it, sweet lady.